When Divina suggested St. Patrick's Day as our topic for the month, my immedate thought was "How will I come up with enough suggestions?" She thought it might be a little ridiculous. St. Patrick's Day, ridiculous? Absolutely not!! I am as Irish as they come and I have the red hair, blue eyes and fair skin to prove it! I celebrate St. Patrick's Day as enthusiastically as any other holiday, especially after spending one on the Emerald Isle. My internal resistance, undetectable to Divina, simply had to do with a lack of ideas. However, she said the magic words, "Green extravaganza!" Green notes have often appealed to me despite the fact that I do not own many green fragrances. However after investigating them, I am convinced I must own more. So what constitutes a "green" fragrance? Friends who are fragrance novices have often asked me what it means, so for them I offer a simple explanation. Any fragrance that contains more than one note related to the great outdoors can be considered green. They appear as terms like "dewy greens", "green notes", or "leafy greens". I have also, for today's selection, added fragrances with green tea, guava, water lily, basil or oakmoss. What do all of these items have in common? Being GREEN. I drew the line at granny smith apple and lime, simply because that would be taking things a bit too far. Citrus and fruity, although nice, are not really what we are after here. The idea is to identify fragrances that remind the wearer of a leisurely stroll through the park on a breezy spring day, a childhood romp in a vegetable garden or, most appropriately, a hike through the verdant, rolling hills of Ireland. · Bond No. 9 Eau de Noho - With notes of watery greens, mandarin, mimosa, violet leaves, cashmere woods, green moss and amber, this fragrance fits my criteria beautifully. A very fresh, clean and green take on violet but one that is extremely light. This choice is perfect for daywear before the evening festivities begin. · Chanel Bel Respiro - Once you have experienced the exquisite beauty of the Emerald Isle it creates a long-standing and unforgettable impression. This is the scent I choose when I mind- travel back to the Cliffs of Maher and Dromoland Castle. Bel Respiro is what I will be wearing come March 17th. · Christian Dior Diorella - With basil, green notes and oakmoss, this choice contains the most greenery of all. Although this is ultimately a fruity floral, the abundance of leaves suggests a green, growing flower or fruit. · Estee Lauder Private Collection - A green floral in a class all its own. See my review, linked to the left. · Lorenzo Villoresi Yerbamaté - The company's description goes like this, "A boundless greenland touching the sky. The scent of grass, of new-mown hay, of countles herbs and flowers scattered in the fields, stirred by the wind and warmed by the sun. A lonely fire in the meadows, the quiet ritual of tea and mate a gentle veil of smoke, rising and embracing." I cannot think of a more perfect scent to evoke the color green. However, it is a bit tricky, this one. Make certain to sample it on your skin before dousing. · Van Cleef & Arpels La Saisons: Printemps - The only fragrance I could find that contains both clover flower and clover leaves. If you have ever experienced St. Patrick's Day in Ireland you know that the holiday is a religious one for the Irish. Rather than wearing green clothing and partying until all hours of the night like those who celebrate in the United States, the Irish quietly pin clover onto their clothing and go to Mass. And the clover is abundant. 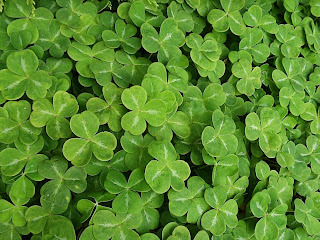 Therefore, in their honor, I include a fragrance with nearly as much clover as that that grows on the Irish countryside. Coach the Fragrance - with notes of green mandarin, guava and water lily, this extremely girly fragrance delivers. Elizabeth Arden Green Tea - my favorite green tea fragrance that puts all the others to shame! Contains notes of green tea, peppermint, oakmoss and celery seed along with lemon, orange and rhubarb. It is nothing less than simultaneously refreshing and calming. Clinique Wrappings - although this fragrance is typically worn around the holidays due to its limited winter distribution, it reminds me of deep, emerald green and for colder climates could be worn proudly on St. Patrick's Day. Fortunately, where I live it is already 80 degrees so I could not choose this powerhouse fragrance. Enjoy the day in whatever way and whatever fragrance you choose. If you live in Chicago or in Ireland, I am green with envy! * Glenna honey, if you're reading, make me proud! Be sure to visit Fragrance Bouquet to read Divina's picks for our green extravaganza. *After living in Chicago for nine years, I truly miss the festivities there. In my opinion, only Chicagoans know how to truly give the holiday its due in the United States! 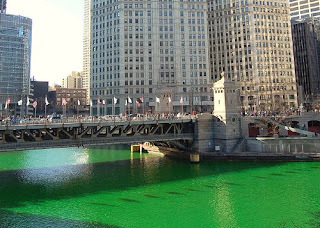 The river is dyed green, a parade takes over the streets, and every Irish pub (and then some) serves green beer. I live in Chicago... but, I would rather be somewhere that was 80degrees already!! I guess you cannot have everything, the green river will cheer me up when I see it coming in to work for a few days.. Loved your Blog for the Day!! Anyway, I really like Bulgari Extreme.. now that is a GREEN perfume, the bottle is even light green.. I also think St. Joseph deserves a perfume as I am Italian and March 19th is St. Josephs day... think ZEPPOLE.. yummy--if you have never had one go to an Italian baker somewhere and have on on Mar. 19th.. they are delicious! !Since I wear RED that day and so do numerous Italians and Polish people, my perfume for St. Joseph would be ROSAMOR by Oscar DelaRente.. Thanks for the chance to vent..
well, I have green eyes and Maher is my middle name- does this mean that I should get a bottle of Bel Respiro? Maybe! is it environmentally safe to dye the river green? what do they use? sounds fun though. Hello Chicagoan with great taste in fragrance! Bulgari Green Tea was on my first draft list but didn't make the cut because it only has one green note in it. But it is a beautiful fragrance so enjoy it for St. Patty's Day. St. Joseph's day sounds really interesting! I'm surprised my husband doesn't celebrate with his Italian heritage. A day of "red" fragrances should be explored!! Thank you for reading, as always. PS: The van cleef one refuses to work on me - it smells so synthetic. I remember I tested the whole season line when we were writing our automn favorites and felt really underwhelmed. Aside from First, eveything I've smelled by Van Cleef & Arpels has been a disaster! Agree that Private Collection is a stunning green chypre. Dawn Spencer Hurwitz Celadon is another smooth green scent. As for color, I adore the emerald green of Chanel No. 19 edt juice. LOL Divina! No you did not!! I just thought it was funny - my internal resistance to this subject at first, considering how much I love St. Patty's Day. Yeah, I've heard similar things about the Saisons collection from VC&A. We'll let First reign supreme. :-) Thanks for the great suggestion, D. Your list contains many that were on my first list. I adore Cabotine Gres! Hi, T! Late to the party, but enjoyed catching up on your posts! Some greens I cannot do, but when I think "green" the scent that always comes to mind first is EL Aliage. My mother wore it while I was growing up, and my best friend did later. Such nice associations for me! I have some vintage Private Collection (a mini I got probably 30 years ago! ), so perhaps that will be my St. Paddy's Day scent. Be well, my friend! Nice to see you Linda!! I hope all is well and that life is good for you two. I remember Aliage but I don't recall its scent. How wonderful that it has such great associations for you. Enjoy the Private Collection and your St. Patrick's Day celebration! Dearest G.!! So nice to hear from you, my BFF. I cannot wait to hear about your St. Patty's Day celebration and what a superb choice in fragrance. ;-) I know your celebration will be second to none! !